Get a $150 Voucher towards Safety Gear of your Choice! Making it commercial fishing has never been easy, but sacrificing safety while working should NEVER be part of the deal. At Fish Safe, we believe practical safety education goes hand-in-hand with essential safety gear. 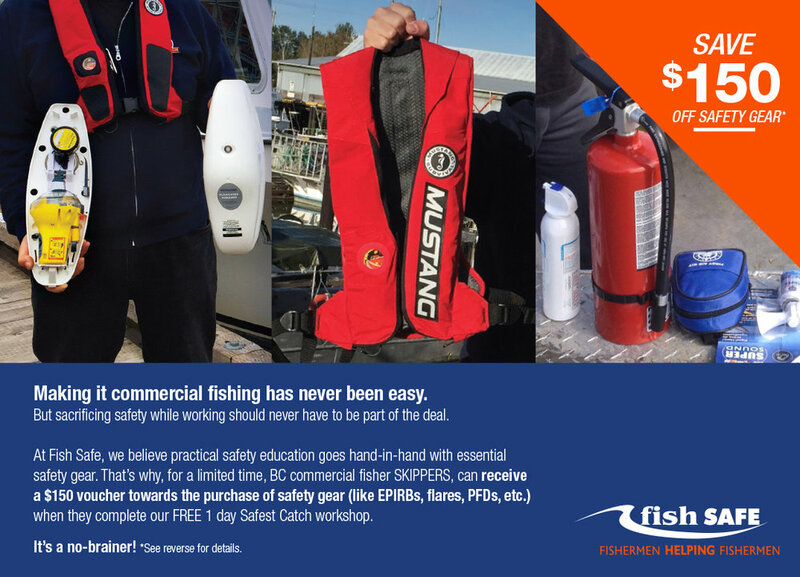 That’s why, for a limited time, BC commercial fisher SKIPPERS, can receive a $150 voucher towards the purchase of safety gear (like EPIRBs, flares, PFDs, etc.) when they complete our FREE 1 day Safest Catch workshop. Combining practical, vessel based safety training with essential safety equipment just makes sense. If you fish commercially in BC, spread the good news and register today to qualify to get your $150 safety equipment voucher! STEP 5: Email your pictures to Fish Safe. Once verified, Fish Safe will send you a cheque for $150 within 30 days! Thank You – We will be in touch with you shortly.